I used to make quiche all the time. It was one of those things I’d make so often I didn’t need to follow a recipe. I especially loved making the pastry but right now I struggle to find the time. There are just too many different steps: making the pastry, letting it rest, making the filling and cooking. At the moment I need something I can prepare and cook in one go whilst my baby has a nap. So, I thought I would try ‘crust-free quiches’ a cross between a quiche and a tortilla. There is no need to prepare any pastry and they are more suitable for babies as the whole thing is soft in consistency. For the filling I chose Spinach and Ricotta, a classic combination. Ricotta is naturally low in salt and a good source of protein and calcium, so is a great for your baby’s health. Spinach is also a fantastic source of vitamins and minerals. These may be suitable from 7-8 month old but like any other ingredients make sure your baby is not allergic. 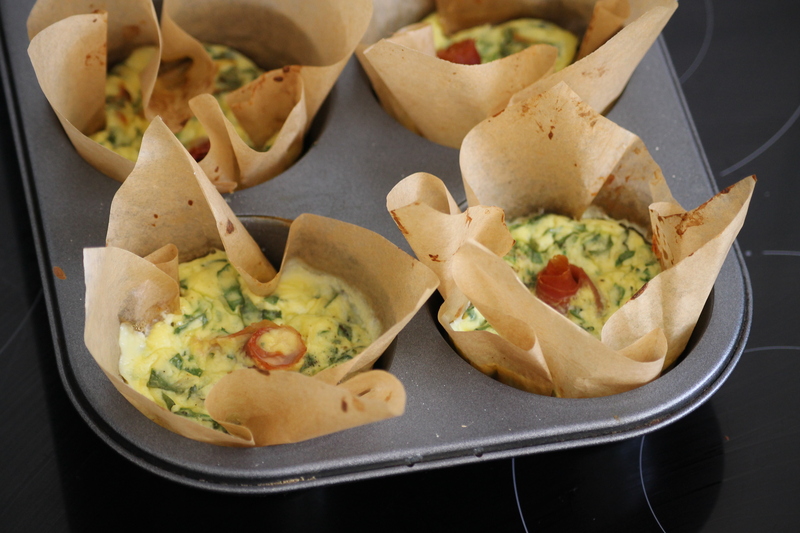 I think these quiches are really pretty in the baking paper and could be a good dish to prepare for a picnic. 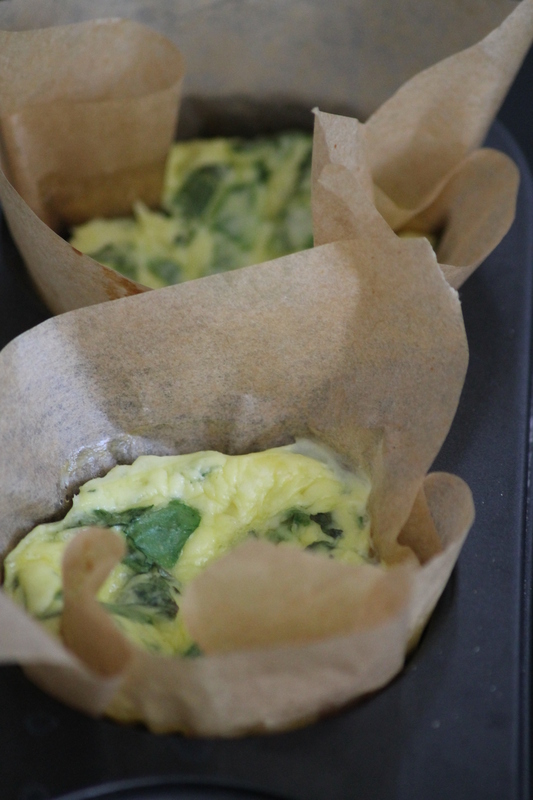 In a large bowl combine spinach, parsley, mint, ricotta, milk, eggs and cheese; mix well. Cut 4 squares of approx 18cm from baking paper and place in muffin tin holes. Pleat and press to create a base for the quiches and spoon out mixture into 4 muffin-sized quiches. Reserve some of the mixture for 2 x cupcake-sized quiches. Place prosciutto swirls in the center. Season with salt and pepper. Bake for 30 minutes. Until cooked through. Cut 2 squares approx 15 cm from baking paper and place in cupcake tin. Pleat and crease to create a base for the quiches and spoon out the reserved mixture from recipe above into 2 cupcake sized quiches. Bake in 180°C oven for 20-30 minutes until cooked through.